Guide to tree planting in Kenya | Infonet Biovision Home. Description: This guide was designed by scientists from Kenya Forestry Research Institute (KEFRI) to provide useful working information to field workers and farmers involved in tree planting in Kenya. It includes information on the requirements of various tree species in different agro-ecological zones regarding soil, climate, uses and expected rotation. Forests and trees play important roles in peoples' lives. They provide unquantifiable benefits such as improving the climate, regulating stream and river flows, conserving and protecting the soil mantle; and providing stable habitats for wildlife. The latter, together with wilderness values, are the foundation of Kenya's important tourist industry. Forests and trees are also the backbone of many important economic activities. They are the source of virtually all the nation's supply of building timber, poles, veneers and plywood, wood-fuel, pulp and paper. Other commodities and services from forests and trees include fruits, oils, tannins, resins, medicines, fibre, shade, browse and fodder. The last three are of particular importance to man and livestock, especially in the arid and semi-arid land areas. Kenya has a small area of reserved forest estate (about 7%). The bulk of the forest estate (200 million ha) support the indigenous forests which provide protective functions as well as yielding wood of high commercial value. Plantations forests (about 0.15 million ha) provide the bulk of wood demand for domestic and commercial needs. Sustainable forest management and the development of social forestry have become important agenda at national and international fora during the last two decades. 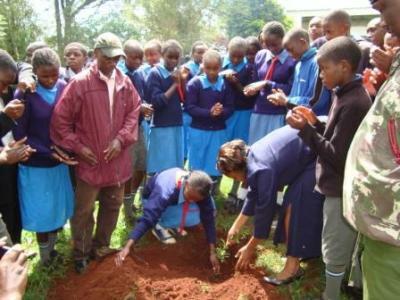 By the late 1970, a number of major international aid agencies and non-governmental organisations became more involved in tree planting and other forestry activities in the country in rural areas. The Forest Department established forestry extensions service in 1971. However, the effort of tree planting outside the forest reserve has created no more than a marginal impact while deforestation has increased. 1) The purpose of planting: Species selected must be able to fulfill the objective for planting them - e.g. soil and water conservation - in catchment areas, improvement of soil fertility (supply of mulching material, green manure), animal fodder, shade, and saleable products such as fruits, fire wood and charcoal, timber for construction, craft materials, etc. Availability of good quality seed on time is a pre-requisite for all tree planting activities. The Kenya Tree Seed Centre, a programme within KEFRI, supplies good quality seed. The centre also provides technical advice on selection of good seed sources. The work of the centre is supported by sub-centres ar Nyeri, Londiani, Kakamega, Kitale, Kibwezi, Gede and Turkana. Quality seed can also be obtained from any sub-centre, field officers of the Kenya Forestry Department or from the Tree Seed Centre at Muguga. Click here to open the KEFRI seed catalogue. It would be important for farmers to be able to obtain tree/shrub seeds from the open market and raise their own seedlings as they do with other farm crops, such as maize, cabbages, etc. The most important species for five of the seven of Kenya's ecological zones have been listed in an alphabetical order under each ecozone (AEZ). Ecological zones I and VII have been excluded because currently there is hardly any tree planting taking place in these zones. The Grevillea robusta originated from Australian and is widely used in Africa, 0 - 3000 m.
It does well on neutral to acidic loam or light sandy soils but is not tolerant to waterlogging or heavy clays. Shelterbelt system The Grevillea .spp may be propagated by use of wildings or seedlings. Pollarding, lopping, coppicing and pruning optimizes their benefits if used in their management. Maturity takes 6 yrs for poles and 30 yrs for timber Firewood, charcoal, timber, furniture, poles, veneer, fodder (leaves low quality), bee forage,shade, ornamental, mulch, soil conservation and, windbreak Some communities believe the species attracts lightning in homesteads. However, it is an extremely important tree in the Kenyan highlands and has become an integral part of the farming system in many areas. The Sesbania spp survive waterlogging and fix nitrogen improving the soil fertility. Naturally, it distributed from Senegal to Somalia and south to South Africa. It's all over tropical Africa and Asia. It tolerates acid and saline soil and is common in riverine vegetation and in Kenya, is found at the margin of fresh water lakes like Naivasha and Baringo and in seasonal swamps. Widely cultivated in western Kenya; 350- 1,900 m above sea level and Ecozones I - IV May occur in dense stands, agroforestry (mixed farming system), conservation The tree is very fast growing and pruning and short rotation is employed in their management. Propagation is by direct sowing at site or wilding and it takes 2 to 3 years to reach maturity. Firewood, poles, medicine (leaves and roots), fodder, shade,soil enrichment via nitrogen fixation,soil conservation (improved fallows), fibre, veterinary medicine and, soap (leaves) The species harbours rootknot nematodes and should therefore be avoided in combination with crops that are very sensitive to nematodes like banana & irish potatoes. Widely used in western Kenya, this tree has a great potential for soil improvement on small farms due to nitrogen fixation and leaf mulch. (Mukinduri) Found in Tanzania, Rwanda, Burundi, Uganda, Kenya, Congo (DRC), Malawi, Zambia and Mozambique. In Kenya is wide spread, from the south to the western and northern parts of the country. Found in Ecozones III-IV but very common in zone III, 1000 - 2000 m above sea level and is well adapted to variable highland soils It may occur in mixed farming systems, woodlots, boundaries and, agroforestry systems It may be propagated by direct sowing at site (recommended), seedlings (sow seed directly in pots) or wilding. (Muringa) A large deciduous forest tree of moist warm areas, woodland and bush. Widespread in Kenya, common in pasture land between 1,200 and 2,000 m. mainly in Central Province, around Nairobi, in Meru, Marsabit, Kakamega, and Kisii Districts and in parts of Rift Valley Province. Tends to be riverine in drier areas. Ecozones II - III. Plantation, mixed woodlots, amenity, agroforestry Propagation; wildings and seedlings. Moderate to slow growing; taking 30 - 60 yrs to mature. Pollarding, lopping and coppicing may be applied. Several seedlings may germinate from each stone. Can be pricked out. Young trees grow best under some shade. Tend to branch a lot if grown in full light. Timber, firewood, furniture, beehives, utensils (mortars), edible fruit, medicine (bark, roots), fodder (dry season), bee forage, shade, ornamental, mulch, soil conservation, fibre, glue, boundary marking. The heartwood is hard and takes a good polish, so the timber is prized for furniture, but it can be twisted and difficult to saw. Often found in cropland where it is managed to reduce shade. Provides very good mulch. (Zusiala) A tropical African tree common in the lake basin and highland areas, to 2,000 m. It stands acid heavy clay soil, but not waterlogging; prefers red loam and has deep roots. Ecozones II-III Plantation/ amenity/ agroforestry systems Propagated by use of seedlings and wildings. Are fast growing and coppicing may be employed in their management. They take between 15 - 30 yrs to mature Firewood (domestic as well as tobacco curing), charcoal, timber, furniture, poles, posts, tool handles, walking sticks, boat building, banana props, medicine (leaves), bee forage, shade, ornamental, mulch, soil conservation, windbreak, ceremonial, boundary marking. The species is widely used in western Kenya. The wood is fairly termite resistant. (Whispering pine) Occurs naturally on tropical sea shores - Pacific and Indian Oceans, making it theCasurina with the widest natural distribution.In Kenya is common along the coral beaches and nearby hinterland, 0-1,400 m. The extensive root system enables it to grow in poor soils. It tolerates salty winds and poor, salty and sandy soils of the beaches. Ecozones I-IV but limited to the coast. Seeds at the coast mainly in July - August and February - March Plantation/ agroforestry Seedlings and wildings may be used. Produces root suckers if roots are exposed. Nursery soil where they are to be raised may need inoculation by addition of soil from beneath mature trees. Are fast growing and prune to get clear bole. Coppices when young, but less vigorously than C.cunninghamiana.. Takes 4 - 6 yrs to mature) Firewood (burns very well), charcoal, furniture, poles (for house construction), posts, boat building (dhow masts), tool handles, fodder, shade, ornamental,mulch, nitrogen-fixing, soil conservation, reclamation of degraded areas, sand-dune stabilization, windbreak, tannin, dye The species is said to exhaust soil moisture and lower the water table, and is tolerant to salt water. It suppresses undergrowth and dry needles on the ground may become a fire hazard. The species is reputed to be one of the best fuel species in the world. Acacia tortilis Common in most of dry Africa from North and West Africa to South Africa. Wide spread in lowland arid and semiarid areas of kenya. Tolerates a wide range of soils, from sandy, silty to black-cotton soils. May be dominant on dry red soils and prefers slightly alkaline conditions. Often stands along rivers, 0-1,650 m. Can grow in shallow soils is among the most drought-resistant of the acacias in Kenya. Rainfall 150-900 mm. Ecozones IV-VII Mixed enrichment/ agroforestry Propagation is by seedlings, wildings, direct sowing at site (seeds taken straight from pod rarely germinate due to seed dormancy), It's slow growing but may grow relatively fast on dry sandy soils if weeding is done and goats are kept away. Also withstands moderate lopping and does not coppice well. Prune when young. Firewood, timber, charcoal, poles, edible pods medicine, fodder (pods and leaves, especially for goats and camels), bee forage, shade (meeting place for Turkana), ornamental, dune fixation, nitrogen fixation, soil conservation, fibre (strings made from bark), live fence, tannin, dye, thorn used as pins or needles, veterinary medicine. The tree is limited to desert areas. Its pods are popular feed for livestock - are even collected and saved for dry season and even sold in northern Kenya. Should not be planted near homes due to its thorns and the likelihood of attracting caterpillars that feed on it. agroforestry systems It's propagated by seedlings or direct sowing at site. Fairly fast growing even in dry conditions; coppicing, pruning. Leaves and pods can be lopped for goats. Fodder (pods), firewood, charcoal,soil protection, poles, posts, edible fruit and leaves, bee forage, shade, gum, tannin and live fence Since the tree has become a weed in wetter areas, planting in cultivated areas should be avoided. There are about 44 mesquites, most of which are found in the warmer parts of the Americas and a few in Asia and Africa.A number of them are terrible weeds. (Mkau) A valuable tree in the ASALs of Ethiopia and Somalia south to Tanzania. In Kenya is found in Kitui, Mwingi, Machakos, Embu, Taita, Samburu, Isiolo, Makueni, Voi, Tsavo National Park and Moyale in dry bushland or woodland and drier wooded grasslands. Altitude ranges from 400 to 1,650 m and in Ecozones V-VI. Does well in sandy to sandy-clay soils to riverine clay/ sandy soils Mixed/ agroforestry systems It may be propagated by seedlings, root cuttings or root suckers, wildings. The tree grows faster if propagated using root suckers. Young trees needs to be protected from goats and coppicing can also be done Firewood, timber (construction, door frames), medicine (bark), fodder (fruit), bee forage, shade,mulch, soil conservation. Wood hard, brown, and makes good timber, resistant to attack by borers.It is a highly prized tree in the dry areas where it is intercropped with food crops with no adverse effects and occasionally improved yields. systems amenity Good mother trees are chosen for vegetative propagation. Seedlings, wildings, direct sowing at site, grafting and budding for best varieties. They are slow growing but long lived; pollarding, coppicing and, pruning may be used. Firewood, charcoal, timber, furniture, poles, posts, utensils (pestles and mortars, carts), boat building, food (edible fruit pulp, pulp also used for souring porridge, drink, fried seeds, seasoning, flavouring), medicine (leaves, twigs, bark, roots), fodder, bee forage, shade, ornamental, mulch, nitrogen fixing, tannin, dye, veterinary medicine The fruit has many uses and is important for nutrition in many parts of the world, not least in India. Maundu, P. and Tengnas, B. (Eds)(2005). Useful trees and shrubs for Kenya. World Agroforestry Centre, Technical Handbook No.35. ISBN 9966-896-70-8.